Our goal is to provide self-service SQL based operational capabilities (SQL-Ops) to organizations and teams that want to leverage existing skills and do not want to worry about the complexity of Apache Kafka. When using Kafka, people need a way to easily visualize the data. Lenses SQL is addressing the data blindness Kafka comes with. Enterprise-grade streaming requires more than just data visualization, it requires joining, filtering and aggregation of data streams in order to provide real-time insights and reports. Until now, to achieve this with Apache Kafka requires developer skillsets (Java, Scala, Kotlin, or any Java Virtual Machine based language) and quite a steep learning curve to master the Kafka Streams API. In addition, Lenses goes a step further and takes care of deployment and monitoring of real-time stream processing with SQL. And it does this while meeting enterprise requirements for security, auditing and data governance. Integration with Kubernetes, the de facto container orchestration framework, provides the scalability and fault tolerance mission-critical applications require. Lenses contains all the Data Ops building blocks for operating real-time data in production, giving leverage to your team to focus on the business requirements rather than the platform infrastructure and learning new technology. It simplifies real-time analytics by encapsulating the underlying complexity of data management operations, and provides significant cost saving and significantly faster time to implementation. Why limit visibility and innovation only to specialists? Lenses provides state of the art SQL visibility into your data flows, engaging all areas of your business as you accelerate towards data driven platforms. Lenses SQL engine sits above your middleware (Apache Kafka), allowing you to focus on discovering and innovating with the data you know best. Lenses SQL support both bounded and unbounded streaming queries to join, filter and aggregate any data format. Integrate Lenses SQL engine into you applications with our Python, Redux or Golang client even you Spark or Flink jobs with the JDBC driver. You can enrich your data in motion, to enhance or refine it in order to make it correct and insightful to work with. 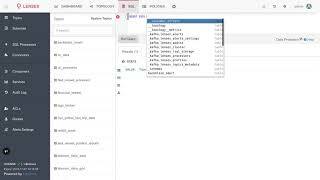 As part of Lenses SQL, we enhance our Kafka Connectors configuration with an idiomatic SQL syntax to instruct the target systems with special options, expressed with friendly SQL code. Don't spend time in cleaning and preparing data. 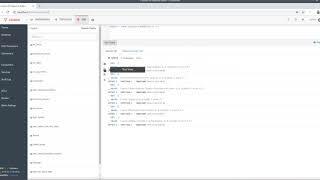 Lenses SQL makes it easy to spin up continuously running queries, over a massive amount of data to easily transform into a format which is easy to work with. 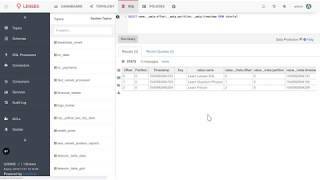 you can quickly investigate your data, try out your joins which can be easily taken to a continuous query after. There are many reasons why you would investigate your data, they span from looking for data anomaly to looking at a given record to check a specific column(or field - the two notions are interchangeable) value for a given record. Every aspect of Lenses is specifically designed to maximize user productivity. Lenses provides, intellisense, not just autocompletion. This brings context aware suggestions to make exploring your data simpler and more intuitive for every user. Irrespective of the data storage format, a user can select nested fields and arrays element, all using an ANSI SQL syntax. The query below has the same outcome regardless of the storage format be it AVRO, JSON, XML, Google’s Protobuf or any other one. A rich set of functions are provided out of the box, in order to support string, date or number manipulation. With the addition of User Defined Function, a user can provide their own functions to enrich the possibilities of Lenses SQL. Lenses platform does its best to understand the table storage format and regardless of the actual format, it keeps a table schema. It can work out if a topic contains AVRO, JSON, XML, INT or Binary, however distinguishing between String, Bytes, Int, Long is not possible without incurring a risk of falsely setting the payload. For the tables using these formats, or Google’s Protobuf or custom format, user input is required. Lenses user interface makes it easy to set the formats - an operation required once. When the tables are empty (i.e. there are no records present) Lenses does not have enough context to determine the payload type, hence it is required for the user to set both key and value payload. It’s important to be able to monitor any executing SQL (be it Table-based or Streaming-based)in order for your team to have leverage in ensuring they meet their SLAs. SQL streaming is a first class citizen. It receives special treatment and gets out of the box real-time performance metrics, its own topology graph (to see how it manipulates the data) and each SQL continuous query will show up in the Lenses powerful data pipelines topology graph. IN_PROC is the default execution mode and the processors are executed locally within the Lenses application. This can have scalability issues and poses a risk to the running application, and can affect stability. IN_PROC is recommended only for testing. Lenses makes data access simple and a gateway for innovation for your teams, but at the same we make sure that you have enterprise ready integrations. Lenses provides Role Based Access Control for basic authentication, but also LDAP and Kerberos integrations. Multi-tenancy is simplified, with whitelisting and blacklisting that also applies to any applications try to access the data. Do you know where you data is going to? Which systems in your data platform contain PII data, which topics and which applications are using them? 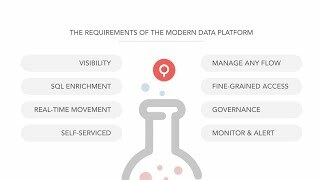 Lenses applies policies on the data flowing through your platform enabling you to answer these questions and track the flow of sensitive data through your organisation. It is paramount to know Who has accessed the data and When. Therefore, all queries, regardless of being table-based or streaming ones, are tracked and audited.